TheRustedChain - The Blog: I'm not a professional. But I still enjoy card making. I usually keep them simple and a bit rustic. See that section in the center? It's wall paper. You can get huge books of retired wall paper samples from home decorating stores. Just go in and ask. They're free. They're discontinued so the business can't use them anymore. The one I have is an "Old World" theme. But they had loads of options for me to choose from. Then when I'm making cards, I just tear a piece and glue it down. They have great texture to them. I'm not a scrapbooker but this would also make a great addition to a scrapbooking page! 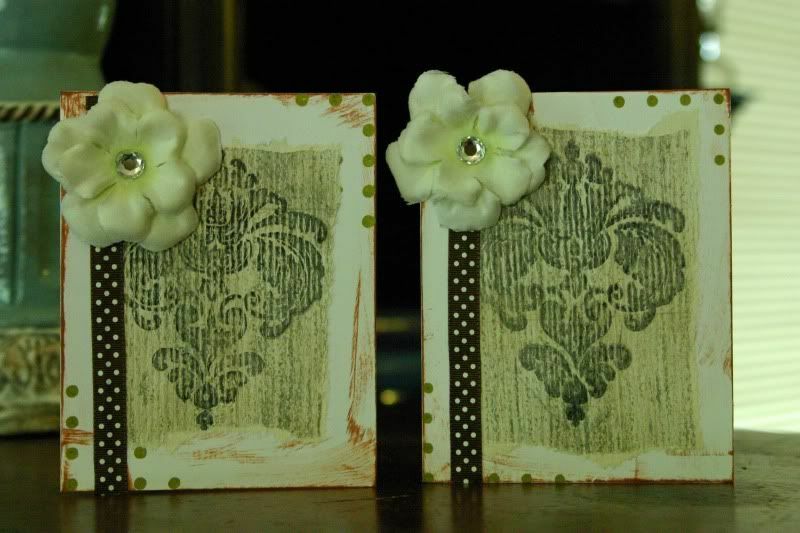 Layer in some stamps, flowers, ribbon, Swarovski crystals, buttons, or whatever. Get out there and create something! Very pretty, and a great tip! Your card is sweet. Just as a fyi- I'm really not sure just who, maybe it was Decor 8 or City Sage, that featured a bedroom that was used scrapes of different shapes, size and colors of wallpaper pasted to the wall like a large collage that actually looked stunning in a bedroom. GREAT idea! I will have to try that! What a clever and frugal idea! Thanks for sharing! ur one smart cookie! nice. Cool beans! Love that idea! You are a vey creative person Beki! Feel free to share ideas anytime! I used to work in a design center, and yes, we were happy to give away the old wallpaper books! I hated to just throw them away, so I'd keep them for people who asked for them or I'd donate them to schools. Lots of fun things you can do with them! i never knew about those books of old wallpaper.... what a fabulous idea! I'll send that to my mom right away - she loves making cards. I'm off to create some butter cream....would honestly rather create SLEEP! Those look great!!! I love the "old" look. Great job Beki, very shabby chic! I love to make cards also, especially at Christmas- everyone seems to love handmade cards. Thanks for the inspiration! You make it sound so easy! I would end up gluing my bottom to my chair, and no one would get dinner because I was stuck! They're very cute. That is a great tip about the wallpaper! I have an award for you on my blog! Please stop by and pick it up! Very sweet card. Great tips. Now I'm going to go make something. *Gasp* Seriously? You can just go in and ask for them? Like, from Home Depot? AND they're free? I might cry... Thank you!